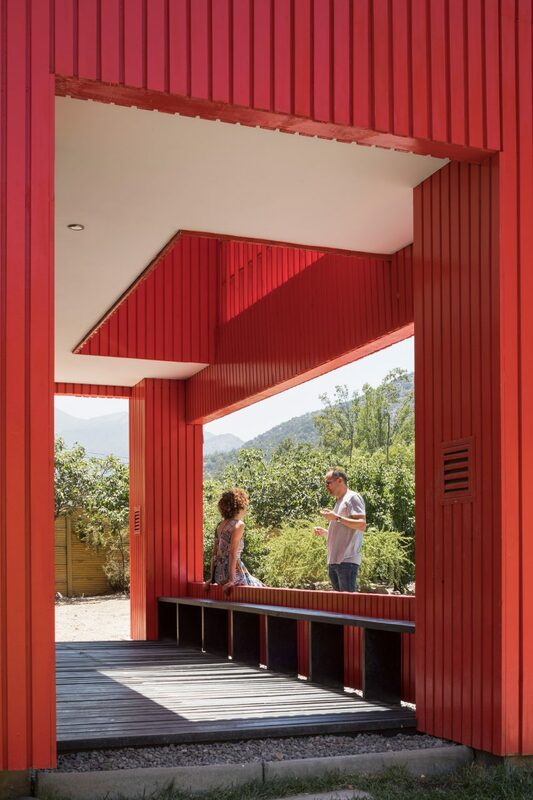 Chilean studio Felipe Assadi Arquitectos has completed a remote dwelling with a vivid scarlet exterior that contrasts with its lush, green surroundings. 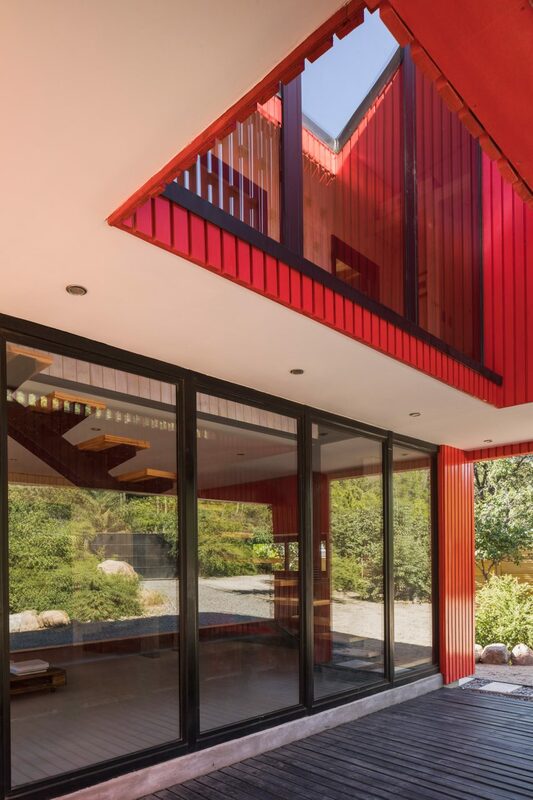 Casa La Roja, or The Red House, is located in San José de Maipo commune in Chile, near the border with Argentina. Homes sprinkled throughout the mountainous zone are afforded a high level of privacy due to their large property sizes and remote location. 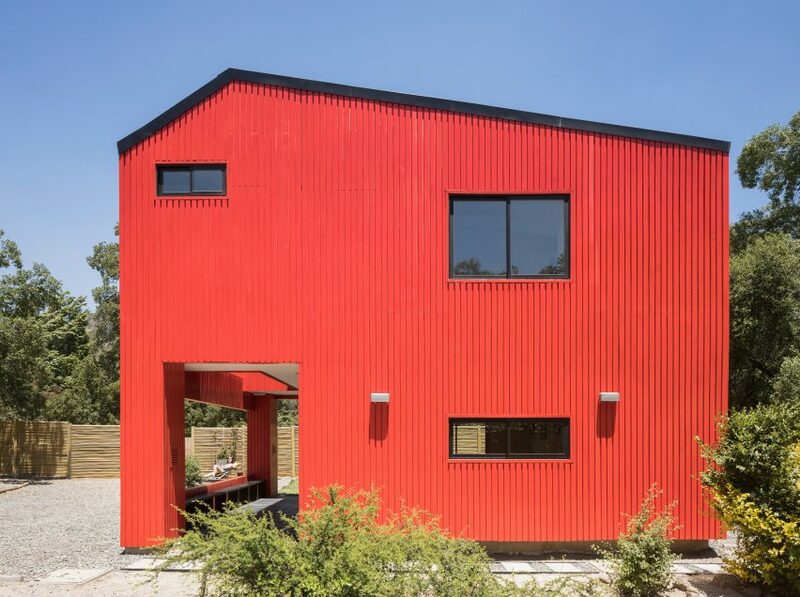 The team opted to paint the building bright red — a colour often seen in neighbouring towns. The vivid hue stands out against the verdant landscape, which is blanketed with shrubs and trees. “The intense green of the surroundings suggests a complementary colour, to activate the relationship between the landscape and the project through contrast,” the team said. 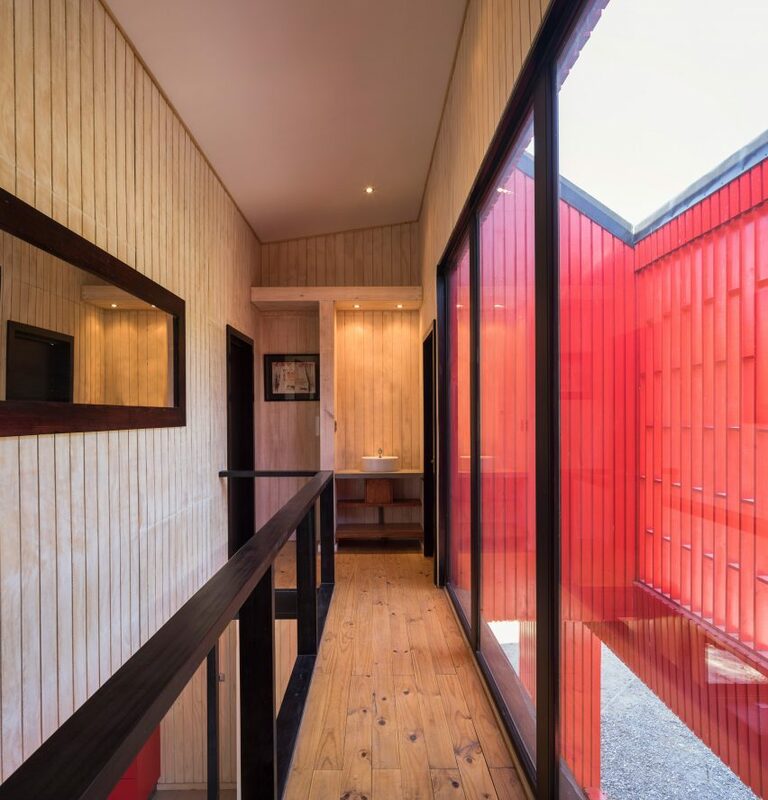 The modest dwelling encompasses 87 square metres, which is distributed across two levels. The design team began with a cube, then cut away portions to bring in light and give the home a more sculptural appearance. “Its shape arises from a solid cube and the subtraction of part of its mass, to generate a double-height entrance terrace and the roof slopes,” the team said. Exterior walls are punctuated with windows of varying sizes. On the east elevation, the team created a covered porch and extracted a portion of the roof, enabling daylight to penetrate the lower levels. Inside, the home contains an open-plan kitchen and living room on the ground floor. 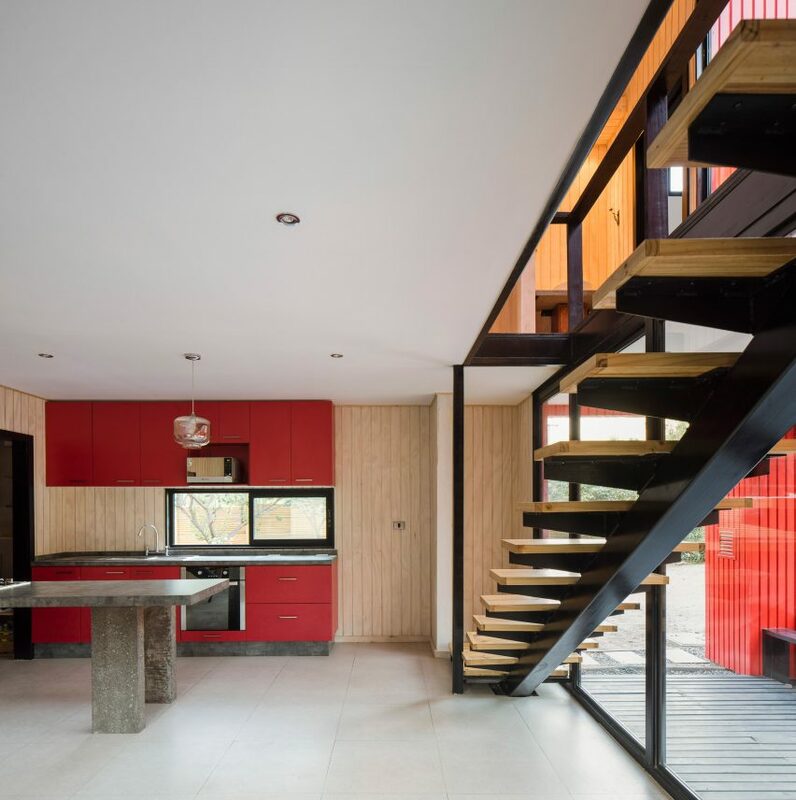 A railing-free stair made of wood and metal leads to the upper storey, where the architects placed two bedrooms. A portion of the floor slab is cut away in order to deliver natural light down below. A restrained material palette was used throughout the interior. Walls are wrapped in blonde plywood beadboard, and floors are covered with beige tiles. Light tones are contrasted with darker elements, such as black frames around doors and windows. The sparsely furnished living room features a leather daybed and a coffee table made from a shipping pallet. In the kitchen, the team installed red cabinetry and an island made of concrete. The house was constructed from scratch, but its dimensions are intended to accommodate prefabrication. Each floor is composed of two modules measuring 8.4 by 3.5 metres. Each module can be transported by truck and assembled on site with cranes. Moreover, modules can easily be added to the current design. “Its symmetry allows for the addition of further programs to the sides, either on the lower or upper floors, joined through the corridor located on the side of the staircase,” the team said. Felipe Assadi Arquitectos has designed a number of projects in rural Chile, which offers a dramatic backdrop for modern architecture. Other projects by the firm include a long concrete house that overlooks the Pacific Ocean, and wooden cabins perched on a hillside in the Patagonia region.